For one week only, 15% off all framed and canvas prints. Any print, any size. Here are some framed print examples. These and many more are available for purchase in the galleria. I'm pleased to announce that gift certificates are now available. If you're stuck for a gift idea consider a gift voucher from galleria mancuso and let your recipiant choose the artwork they would love to have. 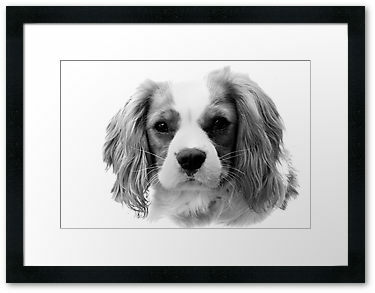 I've created some wonderful high key, black and white images as a new project I started working on aimed members of "Owned by Cavalier King Charles Spaniels" (OBCKCS) group of which I am also a member. I am offering to turn happy snaps of pets into wonderful high key balck and white prints. This idea has grown and can be adapted to almost any subject. If you like the end result and are interested, just drop me a line at amancuso@galleriamancuso.com or head to the contact page. You can check out my new works here. I have added some beautiful new gift packs of a framed or poster print plus 2 matching cards in the special offers section. If you would like a different image, simply go to the galleria, choose which one you would like and send me an email. What a perfect gift idea for someone special. This would make a great house warming present.